On virtually every vacation I take, a trip around the local used record stores is a must. I usually come out with 10+ discs that I may or may not listen to for quite awhile; often they are filling blank spots in the collection. A trip to Portland, Or last year was no different. It took exactly a year to finally get around to listening to the second album by The Cure, Seventeen Seconds. Sharing the same sparse minimalism as the debut, Three Imaginary Boys, Seventeen Seconds leaves behind some of that album’s punky roots and moves the band into its gothic phase. “Play For Today” with the chorus, “and wait for something to happen” bears the most resemblance to what appeared on the debut. “In Your House” features an almost jangly guitar line that Johnny Marr would become famous for a few years later. The instrumental “Three” has a menacing vibe that sees the band moving in a new darker direction. Single “A Forest” adds a bass propulsion to the sound that makes it the standout track and “M” contains the most conventional alt rock sound on the album. 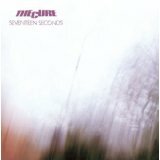 Through no fault of its own, Seventeen Seconds is not the record that the casual fan of The Cure would reach for, myself included. It’s good, very good in spots, but with so many other great albums by The Cure, this one will virtually always get lost in the shuffle outside of the most diehard of fans.